The U S News and World Report recently published their annual assessment of the best 38 diets in 9 categories. For the past seven years, a panel of experts has selected the DASH diet as the best diet overall. The Mediterranean diet came in a close second while the MIND diet ranked third. What makes these diets healthy choices, and how do they differ? The DASH diet, originally establish to reduce high blood pressure, is nutritionally sound and promotes heart health. This diet includes the following daily servings; 4-5 each of vegetables and fruits, 6-8 grains, 2-3 dairy products, 6 or less of fish, lean meat, poultry (one ounce is considered a serving), 2-3 fats or oils. The diet suggests 4-5 servings a week of nuts, seeds, and legumes and less than 5 servings per week of sweets. For heathy individuals, the diet recommends limiting sodium to 2,300 mg/day or less. The elderly or those with certain health issues should not exceed 1,500 mg of sodium/day. The Mediterranean diet is nutritionally sound with diverse foods and flavors. It represents the typical foods eaten by those living in the region around the Mediterranean Sea. That population tends to live longer and have fewer incidents of cardiovascular disease and cancer than is common to most Americans. This eating plan may help with weight loss, improve heart and brain health, and reduce risks of cancer and diabetes. The Mediterranean diet doesn’t recommend specific amounts of foods. However, a typical diet consists of 7-10 servings of vegetables and fruits daily, whole grains, low-fat dairy, fish (1-2 times per week) plus poultry and limited red meats. The diet avoids such foods as sausage, bacon, and other high-fat meats. This diet is generous in nuts, and olive oil is used abundantly in place of other fats and oils. The MIND diet blends the Mediterranean and DASH diets plus specific recommended foods. The aim of this diet is to delay memory loss and prevent Alzheimer’s disease. It is categorized into 10 brain-healthy food groups and 5 unhealthy groups. 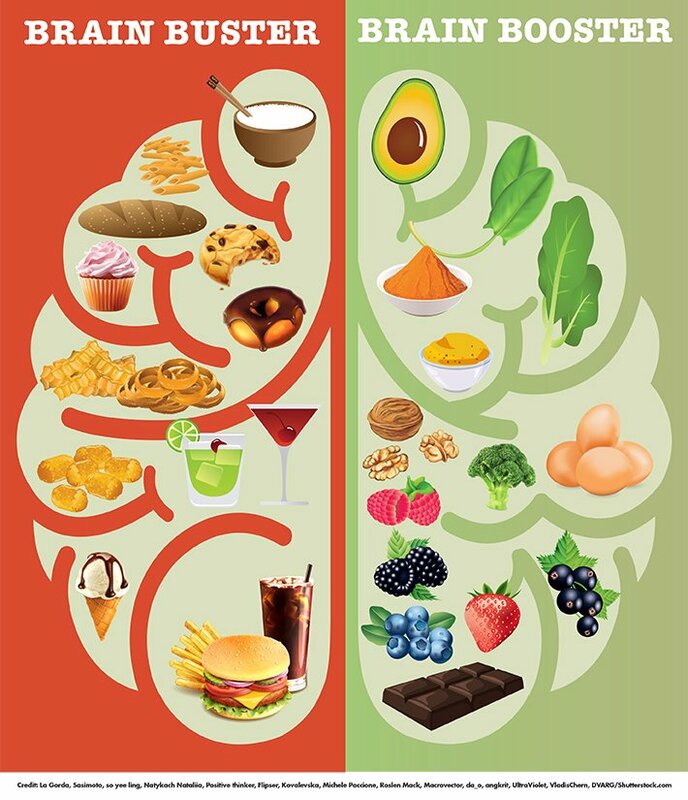 Brain-healthy foods include green leafy vegetables, other vegetables, berries (blueberries/strawberries), nuts, beans (lentils, white beans, etc. ), whole grains, fish, poultry, olive oil, and wine. Foods to avoid include red meat, butter/stick margarine, cheeses, pastries/sweets, and fried/fast foods. Researchers found that those who strictly followed this diet lowered their risk of Alzheimer’s disease up to 53 percent. Even those who moderately followed the diet seemed to lower their risk by up to 35 percent. These three diets demonstrate that foods do make a difference in our mental capacity as well as our physical health. When followed faithfully, both the DASH and Mediterranean diets may delay the onset of Alzheimer’s disease. However, unlike the MIND diet which can help divert the disease with moderate following, the DASH and Mediterranean diets must be followed closely to affect memory or neurodegenerative disease. The DASH diet decreases risk of cardiovascular disease, especially as related to blood pressure. The Mediterranean has been shown to decrease risks of cancer. If memory, dementia, and Alzheimer’s are a specific concern, follow the MIND diet. Our health is in our hands. While other factors influence wellbeing, diet is a major contributor in maintaining quality of life.